What are the results of the ways that collections are understood, curated and interpreted differently? What are the different ways in which different disciplines engage with communities - and what can be learned from them? Can the 'relational museum' offer ways of reconceptualising relationships with communities? How can these specialisms collaborate and increase the uses of collections? How can collaborations help rejuvenate and develop collections without specialist curators? Can partnerships with originating communities benefit other communities? A 'work in progress' session is also planned for up-to-date information on current and on-going projects; this may relate to any field of museum ethnography not just this year's conference theme (informal 5-10 minute presentations are required). Papers from the conference may be considered for publication in the Journal of Museum Ethnography published annually by the Group. The closing date for submissions and abstracts is Monday 6 January 2014. This is set to be a very popular event and early booking is recommended as tickets are limited. After the huge success of the ACE funded 'Engaging Curators' project which is coming to an end, MEG has been successful in applying for further ACE funding to facilitate changes to the MEG website, revitalizing and extending MEG's online presence by increasing content and enhancing usability. We would love to hear from you and would be grateful if you could spare a few minutes to complete our short survey to evaluate our current web offering and contribute ideas and input about what you would like to see available online. of Archaeology and Anthropology (MAA), Cambridge. 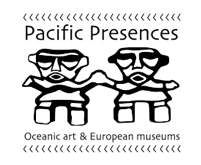 Pacific Presences investigates the art and history of the Pacific, and Europe's engagement with Oceania, through the rich ethnographic collections found in many European museums. Whilst a few works have become icons of Oceanic art, extensive collections, formed over the eighteenth to twentieth centuries, remain largely unstudied. Focusing on collections from the Pacific, which are now in museums in Russia, Germany, the Netherlands, France and the United Kingdom, this project will use inter-disciplinary methods to explore a broad range of artworks from the region. Considering the constitutive role of artefacts in Pacific societies whilst addressing the complexity of their cross-cultural histories, the project aims to confront and explore the colonial lives of the collections and consider their significance and salience to twenty-first centuries communities and audiences, in both the Pacific and Europe. See more on the MAA webiste or follow us on twitter @ppresences to keep up to date on the project and its exciting research. The course is part of Certificate of Higher Education in World Arts and Artefacts administered by Birkbeck’s department of Art History. Introduction to the Arts of the Americas can be taken as a short course or as part of the programme. This module is directly linked to the British Museum exhibition Beyond Eldorado opening in Autumn 2013. Having taught indigenous arts of the Americas since 2002 Dr Max Carocci has been Programme Director of World Arts and Artefacts since its 2008. His interests and expertise in the Arts of North American Indian and Amerindian cultures have resulted in several curatorial positions at the British Museum, the Royal Anthropological Institute and independent art galleries across the UK. Anthropologist by training, Dr. Carocci has conducted fieldwork with several American Indian tribes, and has published extensively on the subject of American arts in articles, essays and edited collections. Among his latest books: Warriors of the Plains: the Arts of Plains Indian Warfare (British Museum press 2012); Turquoise in the Americas (Archetype 2013), and Ritual and Honour published in 2012 by the British Museum Press in conjunction with his exhibitions Warriors of the Plains. -Gain a University of London qualification – expand your knowledge and enhance your CV. -Visit and learn about the rich collections at the British Museum (our world arts partner). -Includes a mixture of practical and contextual modules, covering a wide range of regions, cultures and historical periods.